Place almonds in a food processor; pulse until finely ground. Add flour, sugar and salt; pulse until blended. Add butter and cream cheese; pulse until butter is the size of peas. While pulsing, gradually add buttermilk until mixture starts to form a ball. Divide dough in half. Shape each into a disk; wrap in plastic. Refrigerate 1 hour or overnight. In a large bowl, whisk sugar, cornstarch and salt. Add apricots and berries; toss to coat. Let stand 10 minutes. Filling will be very juicy. Preheat oven to 425°. On a lightly floured surface, roll one half of dough to a 1/8-in.-thick circle; transfer to a 9-in. pie plate. Trim pastry to 1/2 in. beyond rim of plate. Add filling. Roll remaining dough to a 1/8-in.-thick circle; cut into strips about 1/2 in. wide. Arrange over filling in a lattice pattern. Trim and seal strips to edge of bottom pastry; flute edge. In a small bowl, whisk egg with water. 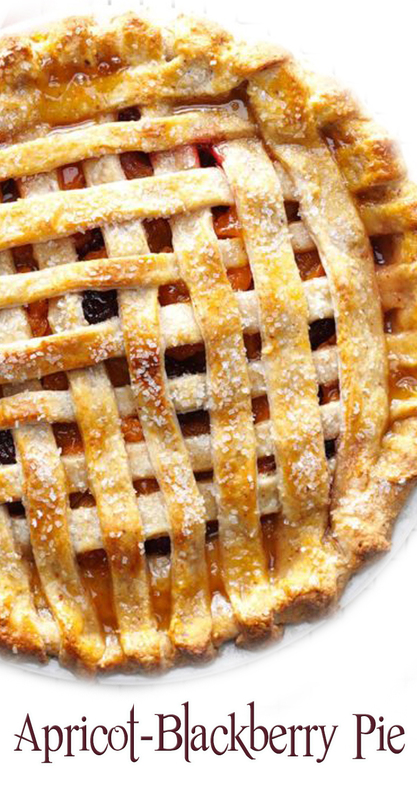 Brush over lattice strips; sprinkle with sugar. Bake 20 minutes. Reduce oven setting to 375°. Bake 45-50 minutes longer or until crust is golden brown and filling is bubbly. Cool on a wire rack.